Obtain the e-mail addresses of your clients! Those who have only started to show interest in your offer, and those who have already become your customers. This will be an important step forward for your on-line marketing. You can then forward your clients a carefully designed monthly e-newsletter or only occasional e-mails with novelties, special offers and other interesting contents. Special effort is required, as the majority of clients are already on the mailing list of different companies. You have to appropriately address your clients and keep their attention. E-mail marketing is an investment which guarantees multiple returns. If carried out properly, e-mail marketing, having numerous advantages, is still far ahead of other forms of on-line marketing. On average, you can make 256 EUR for every euro you spend. So, return on investment (ROI) can reach an exceptional 256 %*. 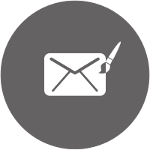 A successful e-mail is specifically dedicated to each client. How do you like your new television? We hope you are completely satisfied with your product and are enjoying your favourite programmes. Have you considered you might need a … in addition to the television? Can you imagine being able to address each recipient of your e-newsletter so personally? With an e-mail marketing tool called “Optines”, everything is possible! What does the Optines tool offer? Designing templates for your e-newsletter to make sure that each issue is ready as soon as possible and that you follow design guidelines every month. Maintenance of your recipients database to make sure it includes only those recipients to whom you can send your e-mail in accordance with the legislation. Sending a large number of e-mails at the same time, as it is sometimes necessary to inform your clients about your offer as soon as possible. Testing e-mails, because you expect them not to include errors and to be properly displayed in different e-mail clients, such as Outlook, Gmail and similar. Preparing detailed reports in order for you to check the success at any time and plan ahead for your next steps. Excellent delivery, as your e-mails were not intended to end up in the junk folder, but were meant to reach your recipients directly. However, the tool itself is not enough! What is required is experience, knowledge of the legislation, understanding e-mail as an advertising medium, technical expertise, etc. Therefore, we invite you to help us use good old e-mail in order to make your business prosper!